Y’all know my aunt sends me home with bushels of apples every year. I get to work making all sorts of fun things with them. There are some examples of apple recipes we’ve enjoyed at the bottom of this post. But one thing I like to do with those fresh apples is to make & can apple pie filling. Then even when unexpected company shows, homemade dessert is ready in a flash. For a fast appley dessert I can use that homemade apple pie filling to make homemade Apple Pie. Or maybe something even faster – Apple Crumble. 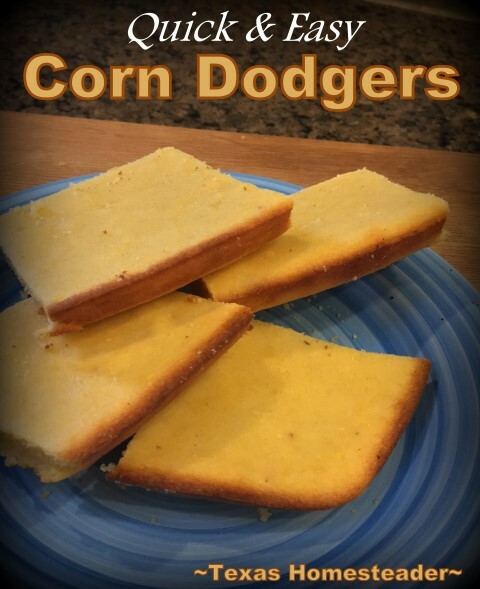 This entry was posted in Blog Posts and tagged Cooking, Frugality, Recipes on March 17, 2019 by Texas Homesteader. But as RancherMan came into the kitchen he saw ‘that‘ look on my face. “What’s wrong?” he asked. UGH! My cornbread wasn’t rising. In my haste to get everything done I’d apparently forgotten to add the baking powder. 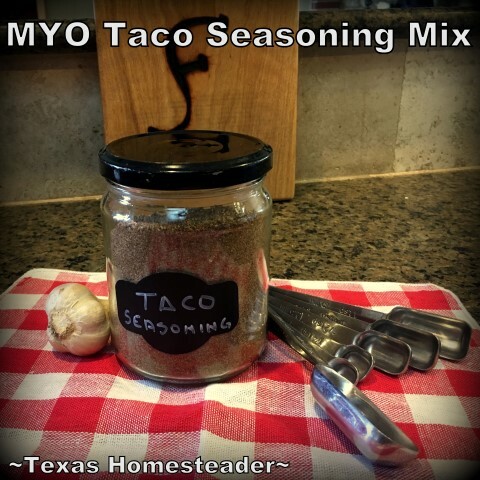 This entry was posted in Blog Posts and tagged Cooking, Recipes on March 3, 2019 by Texas Homesteader. Back in ‘the day‘ I always kept several packets of taco seasoning in my pantry for those days I was making Carnitas Tacos. Or Pulled-Pork Enchiladas. Or maybe Taco Soup. Or… well anything Tex-Mex flavored. RancherMan & I enjoy lots of Tex-Mex food, y’all. You know, ’cause that’s how we roll in Texas! 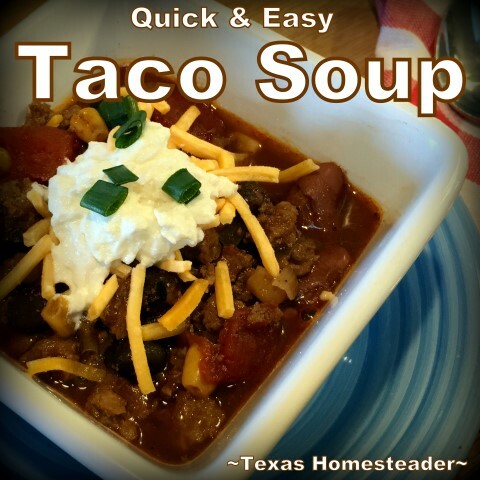 This entry was posted in Blog Posts and tagged Cooking, Make-It-Yourself, Recipes on February 14, 2019 by Texas Homesteader. The skillets in my kitchen are comprised of a single stainless steel skillet for making my Homemade Chocolate Pudding and such, & several sizes of cast-iron skillets for cooking virtually everything else. Now I love my stainless skillet but let’s be honest, I love cast iron the best. I make spicy Cornbread and Bake Bread in cast iron. And I use those skillets on the stove top too for cooking Potato Cakes or frying potatoes. (or anything savory!) It rocks my world whether I’m using it stove top or oven. It does it all. But it’s true that Caring For Cast Iron is a little different than typical cookware. And although mine’s virtually non-stick after decades of use, there still comes the time when frying potatoes or cooking scrambled eggs causes a layer of cooked-on food to remain on the bottom of the skillet. Now back in ‘the day‘ I’d scrub-scrub-scrub to get it clean again. 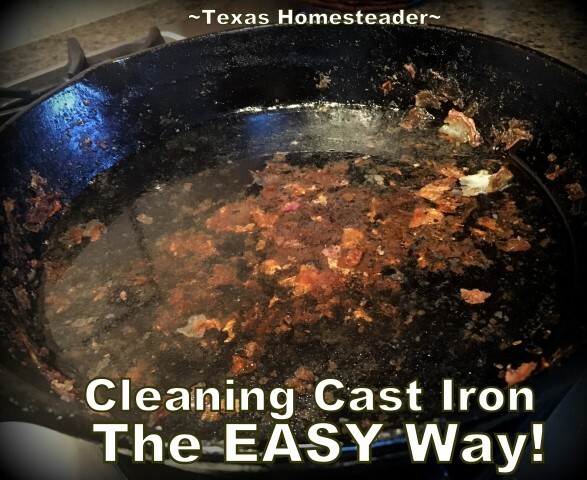 This entry was posted in Blog Posts and tagged Cooking on February 10, 2019 by Texas Homesteader. At the end of each year I like to share with you, my beloved readers, the top 10 homesteading posts of the year found right here on this little ole blog of mine. This year y’all enjoyed fun recipes, cooking shortcuts, tips, money-saving ideas and much more. Wonder what the most popular posts of the year were? I’ve shared below the posts that were read most often. 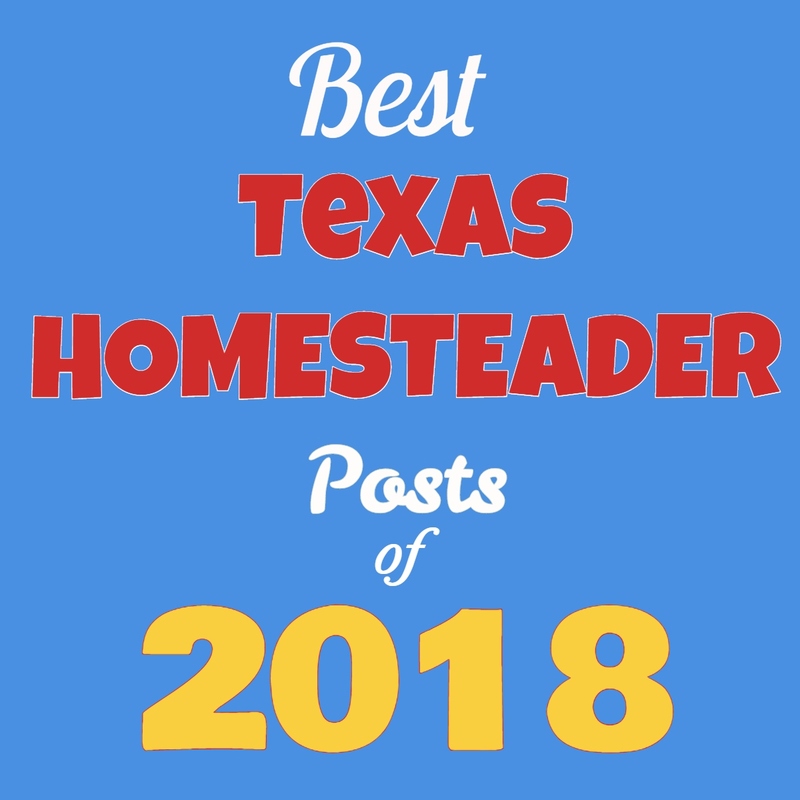 Grab a cup of coffee and enjoy these top 10 Homesteading Posts of 2018! 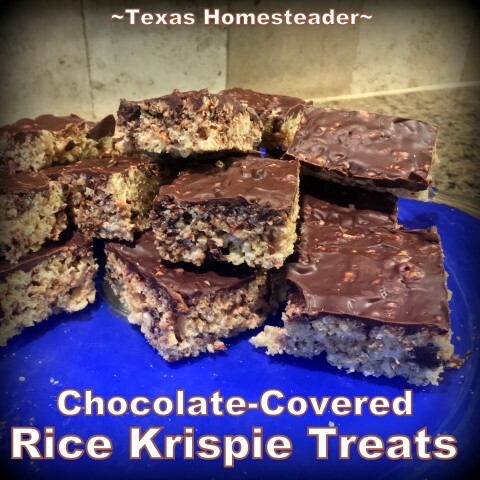 This entry was posted in Blog Posts and tagged Cooking, Holidays, Recipes on December 27, 2018 by Texas Homesteader. Homestead Hack: Don’t Flush Cooking Fat Down The Drain! We’ve all probably done it – rinsing out remaining fat and letting it go down the drain. A quick flip of the garbage-disposal switch and the greasy problem is gone. Right? I’ve written before about how I’ve discovered how the problem Is NOT Gone when we flush things through our kitchen sink pipes. I’m not casting stones here. I spent plenty of my younger years flushing things down the sink, from plate scrapings to burnt-on food. And yes, the fat too. I figured if I used hot water it would simply flush that fat away safely. But I’ve learned a lot since then. I now know you should never flush grease or fat down the sink. But how do you dispose of it? 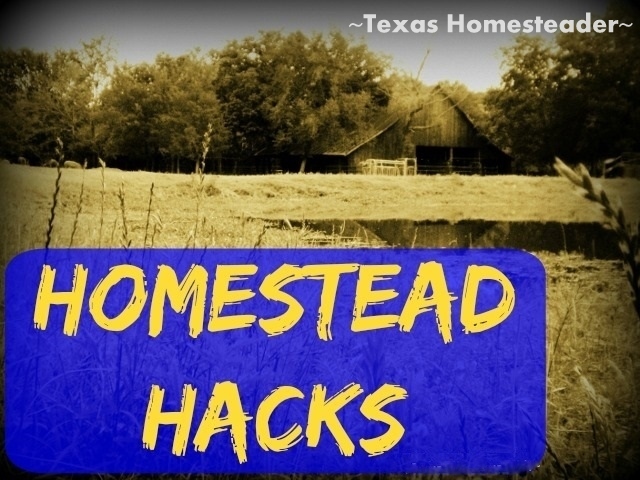 Don’t worry, it’s easy – check out this Homestead Hack. 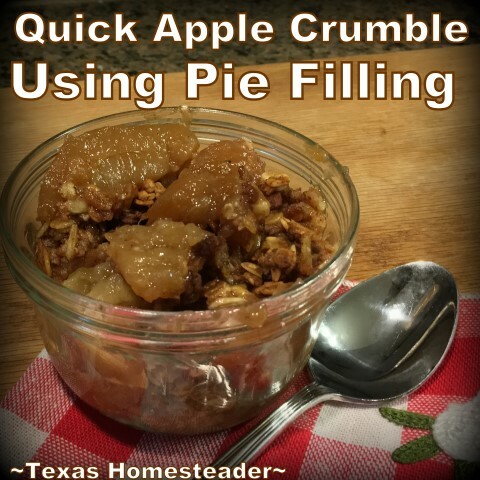 This entry was posted in Blog Posts and tagged Cooking, Homestead Hacks on December 20, 2018 by Texas Homesteader. We like to invite my parents to join us for supper whenever we can. There’s just something about breaking bread together that bonds people, don’t ya think? And heck, my folks live relatively close so why not? Typically RancherMan will grill the main entree and I’ll provide the sides and dessert. One of our favorite sides is Roasted Fresh Vegetables because it’s eye-catching, healthy and easy. But I’ve made that side the last 2-3 times that they joined us. Although they loved it, I wanted something different this time. Hey, I have that gorgeous rosemary bush right outside my door. Why not put it to good use? 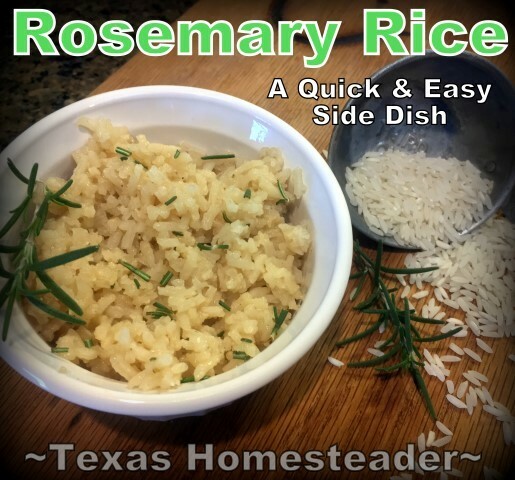 I decided to make rosemary-flavored rice for a quick & easy yet delicious side. 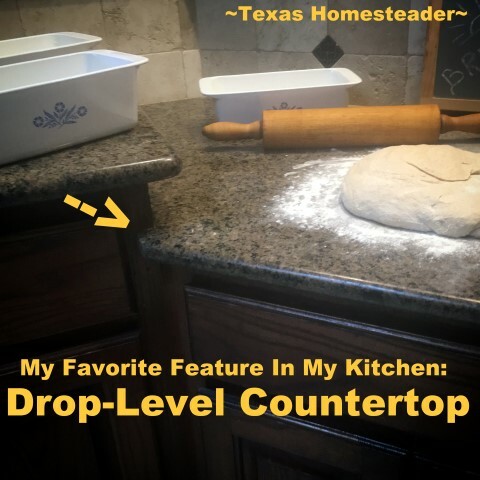 This entry was posted in Blog Posts and tagged Cooking, Frugality, Recipes on December 9, 2018 by Texas Homesteader.